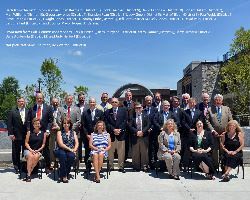 The Williamson County Board of Commissioners, also known as the County Commission, is the legislative body of the county government and as such it is the primary policy-making body in the county. The County Commission consists of 24 elected members, Two from each of the 12 voting districts of Williamson County, who serve a four-year term of office. The County Commission operates with a committee structure - most Commission business is first considered by a committee of its members before coming to the full Commission. Williamson County has a number of both standing, statutory and rotating committees. The County Clerk serves as the Secretary to the Board of Commissioners and is responsible for maintaining all official records of the meetings. 2nd Monday in January, February, March, May, June, July, September, October, and November. Note: The July meeting is held at 9:00 am. All meetings are open to the public and persons requiring ADA accommodations should contact Risk Management at (615) 790-5466, this request, if possible should be made at least three days in advance of the meeting.